It’s Thursday, January 20, 2011 and it’s snowing and cold outside; while driving home from work this afternoon I was trying to think of something easy, warm and yummy to have on this cold winter evening. I remembered buying a bag of 15 bean soup mix so I called Kenny and asked him to put them in a pot of water and bring to a rapid boil and turn them off. I knew that that would expedite the cooking process when I got home. I got home and threw the soup together… no recipe needed. All I did was rinse the beans in a colander; and got some frozen ham chunks from the freezer (leftovers from our honey glazed ham), chopped it up and added some fresh diced onion. I quick cooked the ham and onions added some ground chipotle pepper, salt and pepper. 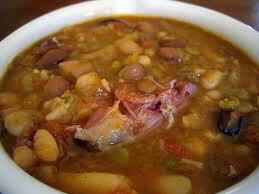 I then added the partially cooked beans and some water. Cooked them for about 40 minutes and then added a quart of our home canned tomatoes, brought back to a simmer and was ready to eat. While the soup was cooking I decide to make some corn cakes to have with our soup, (I added that recipe to the website too) dinner was ready in a little more than an hour. It turned out to be excellent; I hope you enjoy it as well.